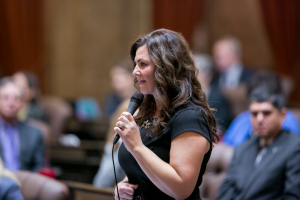 OLYMPIA, Washington — A bill sponsored by Rep. Kelly Chambers, (R-Puyallup) to create a specialty Washington wine license plate has been approved by the Washington State House of Representatives. Under House Bill 2050, a fee of $40 would be charged for the plate, which would feature a scenic landscape of Washington wine country. Funds generated from the sale of the plate would go to the Washington Wine Commission to support research and collaboration with the wine science facility at Washington State University’s Tri-Cities campus.